While building your business, you might have to make some decisions about what kind of office space arrangement is best suited for your organization and business model. Before you make these decisions, you not only need to know what your business needs are, but also what types of office situations are available to your small business. Maybe your small business is best run from home or on the road. You will still discover that you need a proper professional business address, preferably one at a prestigious business location. In that case, you may only need a virtual office arrangement that offers mail service for a low monthly fee. Your customers see that you have a real physical business address – and not just a home office or a post office box. Some small businesses need a little more than just as small business address at an office business centre. They need to have a professional receptionist to answer and forward their calls in order to appear like they are working from that particular office. This virtual office situation not only keeps up appearances, but it also allows a business to have its calls answered by a live professional receptionist who handles the business calls in the most professional manner as directed by you. When your small business outgrows the technology you have in your home office, but you do not need a full-time office, you may want to consider a shared office space that gives you part-time office space with access to full-time technology in a professional office environment. Other terms for this type of office space arrangement are; hot desking, shared virtual office space and co-working. But essentially, they are all shared office space with the benefits of being a client of a office business centre. Oh? You need more of a more permanent office space with your own desk and files, but do not need a private office? Why not consider a semi-private office within an office business centre? This type of office space arrangement gives you a permanent desk in an office that you only share with one other tenant. In most cases, the two people sharing a semi-private office will not be in the same space at the same time because they work at the office at different times on different days. As your business grows and perhaps you need private office space for yourself, an office business centre can offer you serviced office space that is strictly used by you or a potential associate. 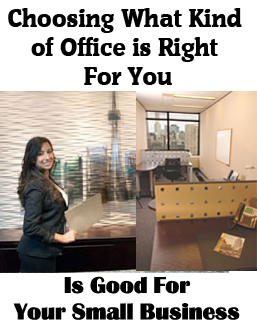 The advantage to this is that you can also choose a larger private office space for rent Toronto to share with several members of your team – and grow into larger team space without having to change any of your contact information. There are other advantages of renting office space at an office business centre, beyond the flexibility of moving within the space without having to change your address or your phone number. Since office business centres offer free office furniture and allow access to technology, you do not have to worry about maintaining that techology or moving it when you change office spaces. Whether you are an office space tenant that has free use of boardrooms and meeting rooms, or a virtual office client that uses mail service or telephone and mail service (that has reduced-rate access to those same boardrooms and meeting rooms), you still have access to many other office services on an a-la-carte basis that you would not have at other stand-alone traditional office space for rent locations.